Thu., Jan. 24, 2019, 12:16 p.m. If you love to color or paint, here’s your chance. 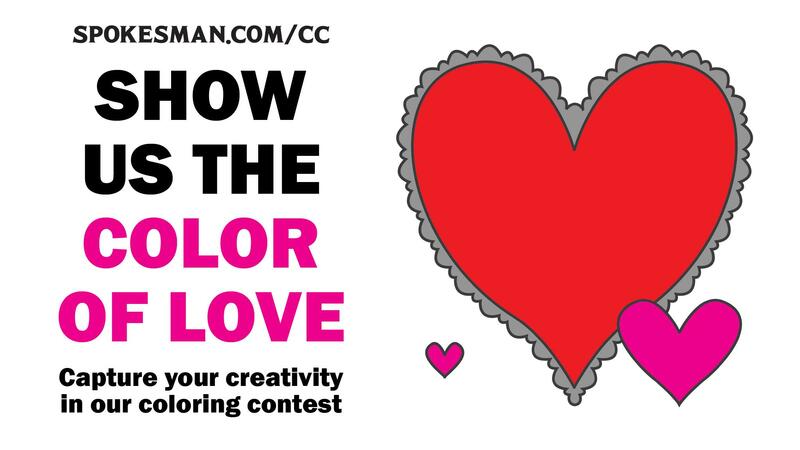 It’s time for The Spokesman-Review’s annual Valentine Coloring Contest. The contest is open to children 12 and younger. Entries will be judged by a panel of Spokesman-Review staffers who will choose winners in three divisions: age 4 and younger, ages 5 to 7, and ages 8 to 12. Winners will receive a gift certificate to Mobius, good for admission to either the Children’s Museum or the Science Center, and their entries will be printed in the newspaper Feb. 14. As many entries as possible will be displayed at Mobius Kids, in the lower level of River Park Square. TO ENTER: Mail your entry to The Spokesman-Review Coloring Contest, P.O. Box 2160, Spokane, WA 99210, or deliver them to the S-R office at 999 W. Riverside Ave. Entries must be received no later than 5 p.m., Feb. 11, and cannot be returned. Be sure to attach a separate piece of paper that includes your name, address and telephone number so we can contact you if you win. Photocopies of the form are acceptable, and a copy of the form can be downloaded at www.spokesman.com/cc. Published: Jan. 24, 2019, 12:16 p.m.